Divine elegance! 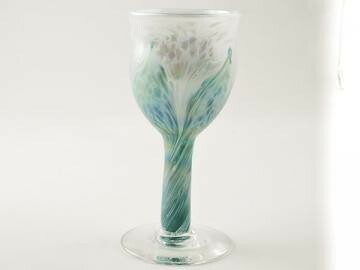 A classically designed wine glass by Ron Hinkle/Hinkle Glass. 6 3/4" tall x 3 1/4" diameter. A pastel turquoise swirls up from the crystal foot and evolves into a snow white mountain at the top of the glass. 6 3/4" tall x 3" diameter. Signed and dated by Ron Hinkle.